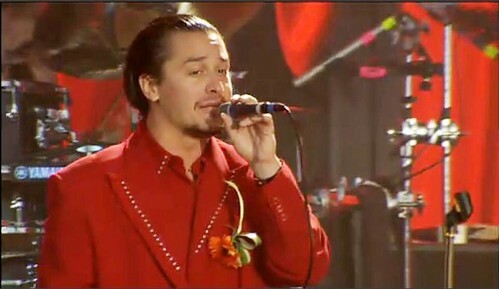 I love Mike Patton. There, I've said it. 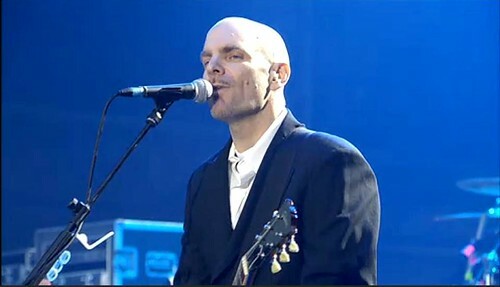 In almost every incarnation, this musical Renaissance Man has been there for me, providing an awesome soundtrack to my life. Mr Bungle, Tomahawk, Fantômas, Lovage, Kaada/Patton, General Patton vs The X-Ecutioners (Peeping Tom not so much - sorry Mike), and of course the great, the seminal Faith No More which sadly disbanded over a decade ago. Last Wednesday the impossible happened. 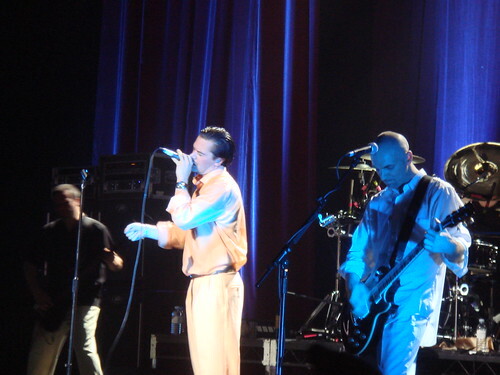 The rumours were true - Faith No More reunited at Brixton Academy and I was lucky enough to be there. When hubby and I arrived at Brixton to meet up with friends and family, six golden tickets were burning a hole in my pocket. Anyway, at 9pm, the lights dimmed and one by one, amidst cheers, Roddy Bottum, Billy Gould, Jon Hudson and Mike "Puffy" Bordin appeared (the first three in beautiful pastel lounge suits with buttonholes) and a lilting keyboard refrain began. 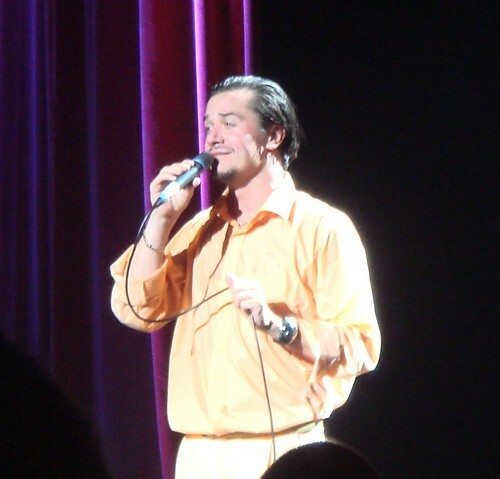 Finally Mike Patton walked onto the stage in a fetching peach number and he started to sing. The excitement in the air was palpable. The song? "Reunited" (by Peaches and Herb) a gorgeous, cheesy torch-song, typical of their tongue-in-cheek humour and so wonderfully apt for the first song for Faith No More to perform together after 11 years. I actually felt tears in my eyes. 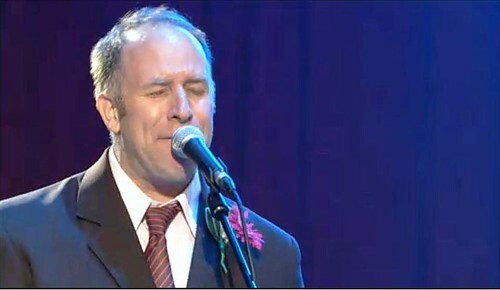 The rest of the set was fantastic - almost two hours of breathtaking music. It was wonderful to hear "Epic" done with such passion, especially when my husband had convinced me that it would be performed sarcastically. The stand-out track for me was "Just a Man" which was growled so lustily by Patton, it actually surpassed the album version (and others agree with me). The only bum note was when they did "Easy", but only because we were surrounded by tone-deaf audience members caterwauling along. 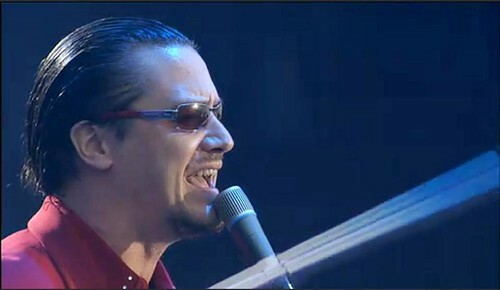 I knew Mike Patton still had it in him, but it was astonishing to see how well the whole band gelled - the camaraderie and harmony was brilliant to see and hear. 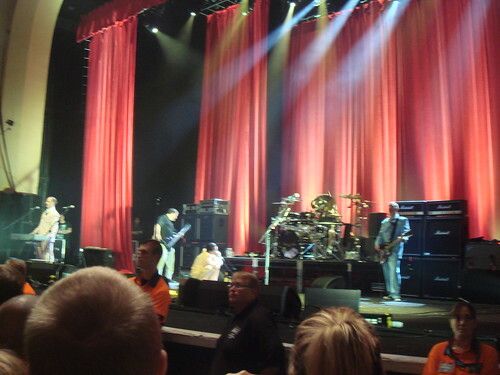 As the show wrapped up, my family, friends and I looked at each other as we realised we had witnessed a very special moment - the Faith No More Reunion. Of course, the excitement didn't end there though. 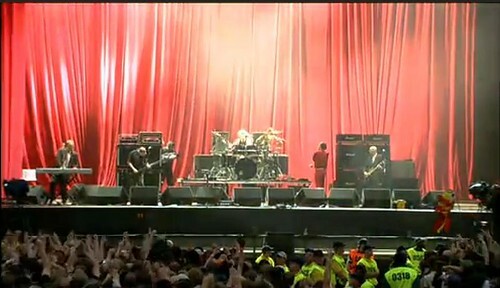 Last night, Faith No More headlined at Download - a metal festival at Donington Park. They performed in front of 70,000 fans, and hubby and I watched in awe as Download kindly streamed the show online to fans worldwide. 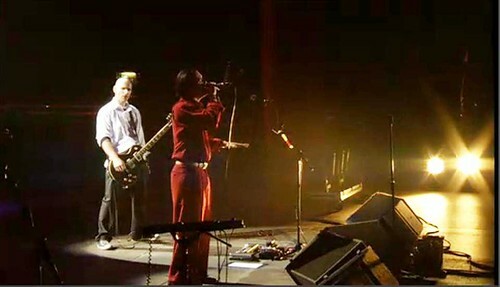 They did a couple of songs that we didn't get at Brixton, such as "Ashes to Ashes" and "Take this Bottle". They also did "We Care A Lot" - a pre-Patton, Chuck Mosley era number - and I think Patton showed what he thought of it as he performed sit-ups whilst singing. 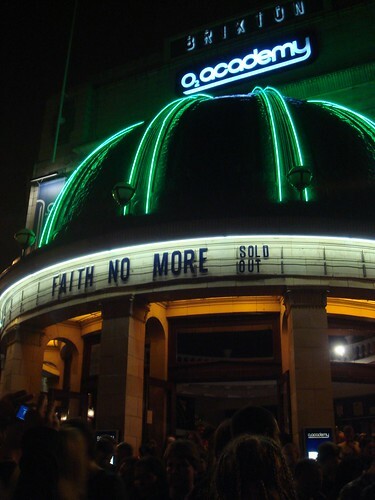 The whole set was just as fantastic, but I couldn't help thinking how lucky we were though, to see Faith No More in the relative intimacy of Brixton Academy with its capacity of less than 4,000. 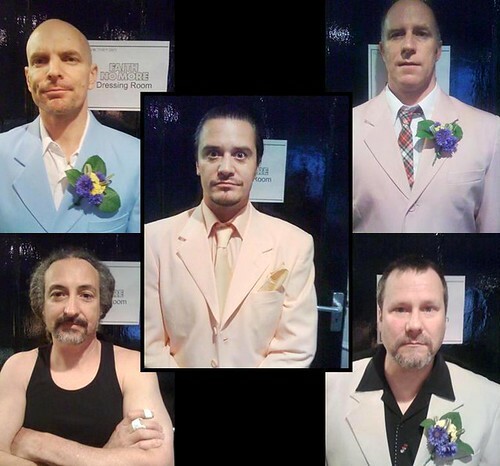 More of my Faith No More Photos here. 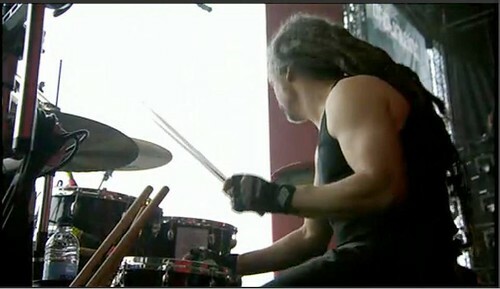 More of my Faith No More Videos here. All Brixton photos copyright me, except for the one at the top which came from Roddy Bottum's Twitter. Excellent pictures and video! You were at the right place at the right time; even the tall people during stripsearch didn’t ruin it. 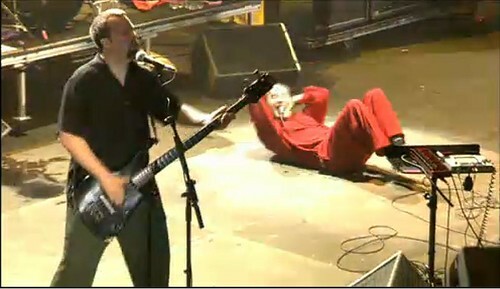 I agree that the Brixton show was special. You were there the first time they dropped Reunited before everyone had a chance to google the song. You were there for Just A Man, which seems to be unique to that night. Thanks for sharing. Thansk Mike, you're very welcome! Your pics are unbelievable---totally makes a Chicago food blogger/FNM enthusiast such as myself, feel like I was actually there! BTW-I just got your twitter note...sorry I didn't see it before. Your blog is great!